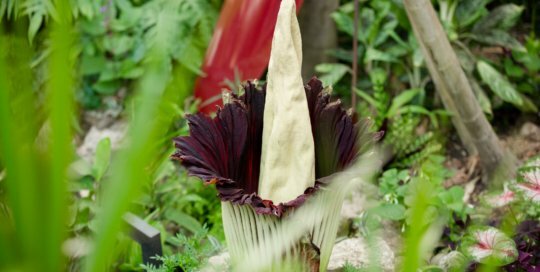 On July 25, 2017, the Botanical Garden flowered its first Amorphophallus titanum (corpse flower), the first of its kind in Iowa. Named Carrion My Wayward Son (affectionately referred to as Carrie) in an online contest, this botanical exposition attracted 11,843 visitors from July 13-31, including 4,636 on bloom day alone. Curatorial horticulturist Derek Carwood was successful in pollinating Carrie and seedlings will find their way to other botanical institutions across the country over the course of the next year. 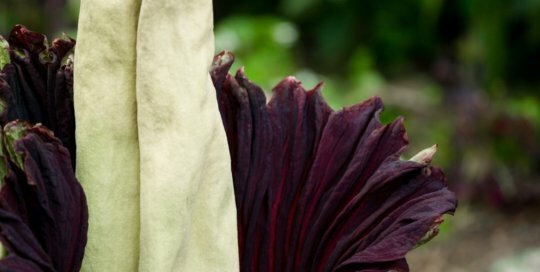 Q: What is a Titan arum? A: Meet Amorphophallus titanium, also known as the Titan arum (singular: Amorphophallus; plural: Amorphophalles). It’s actually a giant tropical relative of our native Jack-in-the-pulpit (Arisaema triphyllum). This exceptionally rare flower has the largest inflorescence (group of flowers growing from one main stem) in the world. But what makes it so unique — and what draws visitors in droves — is its smell. 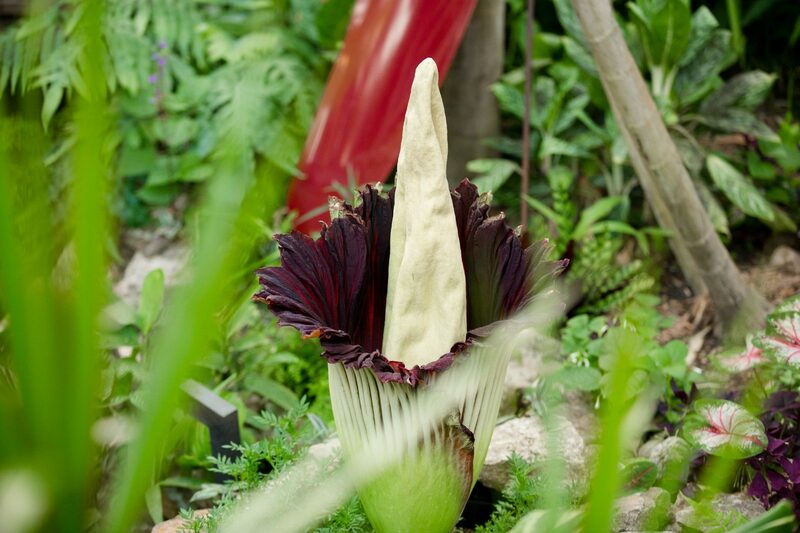 When it unfurls, the Titan arum emits a strong odor akin to rotting flesh. Q: Why does it smell so bad? 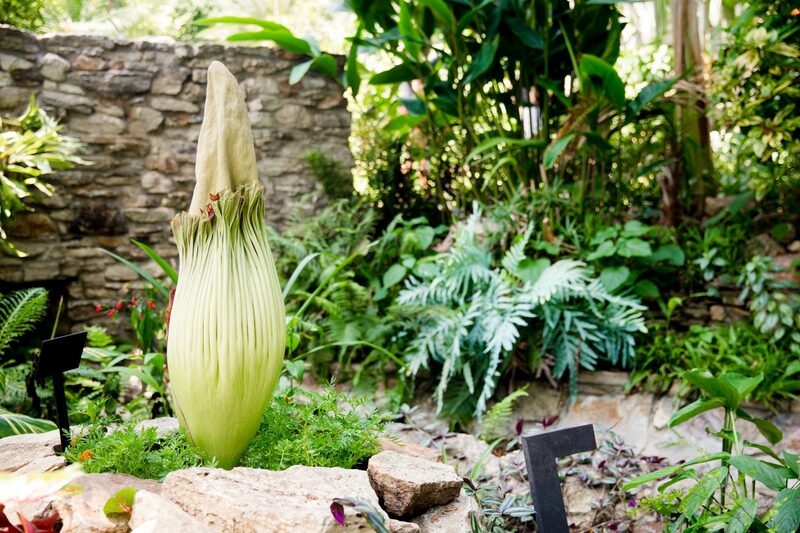 A: The Titan arum’s death-like odor actually brings forth new life. By mimicking the smell of decaying matter, insects such as beetles and flies attracted to the scent land on the plant. As a result, they inadvertently pick up pollen and carry it from one flower to the next. Q: How does it grow? A: The inflorescence (flowering structure) emerges from an underground bulb-like structure called a corm. At up to over 200 lbs., Titan arum’s corm is the largest structure of its kind. The inflorescence consists of a spathe (outer structure) wrapped around a spadix (a spike-like structure that holds the flowers). The spathe is green and speckled with cream on the outside. 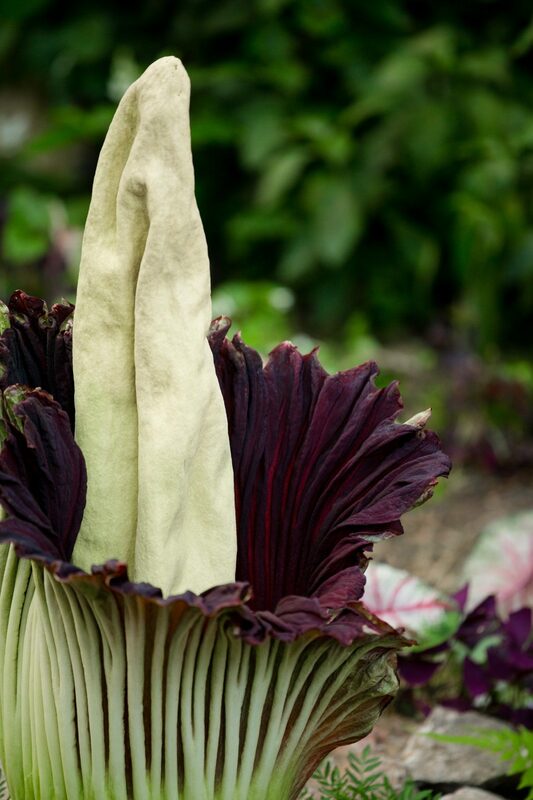 The interior is deep purple with ribbing and a frilled edge, with a circumference of more than nine feet in larger plants. At the base of the spadix, within the spathe, is a band of cream male flowers above a ring of larger pink female flowers. 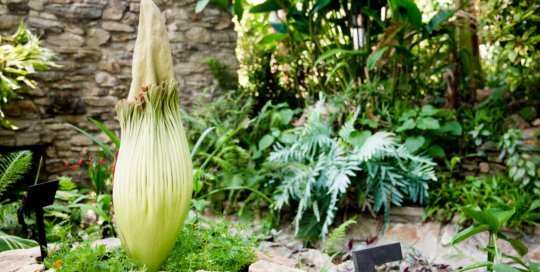 When the flowers are ready for pollination, the spadix heats up to 100 degrees Fahrenheit and emits an odor similar to rotting flesh. Q: Where does it come from? 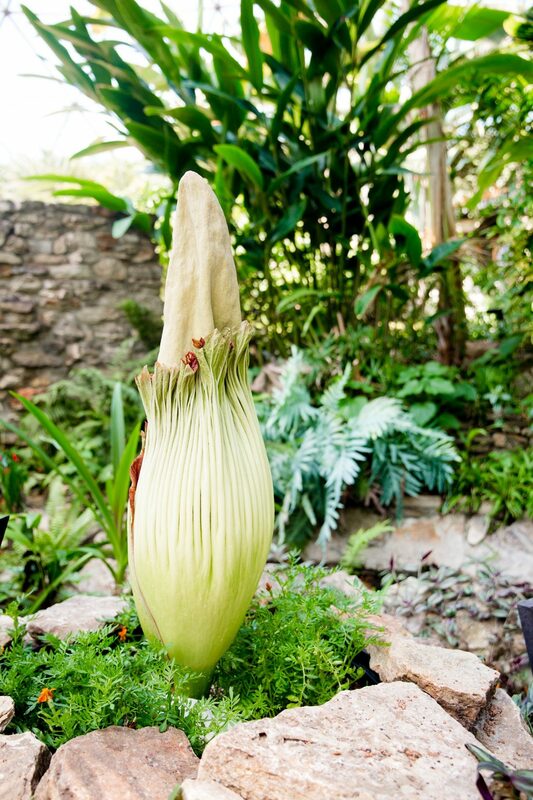 A: The Titan arum only grows in the wild in Sumatra, Indonesia. Botanical gardens across the world have cultivated them over time, but inflorescences are still rare due to their highly specific growing conditions. This particular plant was brought back to Iowa from Huntington Botanical Gardens in San Marino, Calif. in 2013 by Whitney Bouma, Greater Des Moines Botanical Garden’s Director of Education and Outreach. Q: How big will it get? 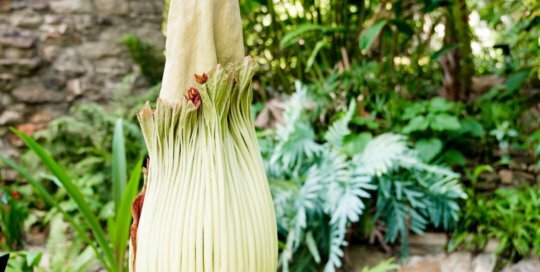 A: Inflorescences can reach ,more than 10 feet tall, but Carrie the Corpse Flower topped out at 44.5” in her first-ever bloom. Q: When will it bloom? A: Inflorescences grow until fully mature. Then, they unfurl within hours and with little notice. That said, the process typically begins in the late afternoon and continues into the evening. Carrie the Corpse Flower bloomed on July 25, 2017. Q: How long does the bloom last? A: Less than two days—most inflorescences last 24-36 hours. Q: What happens after it blooms? A: After fruiting, the entire structure collapses and a leaf of up to 15 feet tall is produced. The leaf produces sugars, then sends them to the corm for storage. Each year, the leaf withers and a new one develops. When the plant is ready to flower again, the corm goes dormant for up to four months before another inflorescence emerges. Q: When will it bloom again? A: No one knows for sure—but not likely for at least 3-5 years. As more institutions and private growers perfect cultivation of this species and its relatives, we will hopefully see an increase in the genetic diversity within the population and more inflorescences in the future. Q: How do you protect the plant from pests? A: As Amorphophalles are prone to attack by nematodes, we’ve planted French marigolds (Tagetes patula) around the plant that serve as a natural barrier. It’s part of our commitment to organic, chemical-free gardening and works quite well. Q: Why is it so important to protect and preserve these plants? A: Titan arum falls victim to poaching, deforestation and land clearing for palm oil plantations in its native habitat. According to the Chicago Botanic Garden, up to 72 percent of its natural habitat has been destroyed. Amorphophallus titanum (Carrie the Corpse Flower). Photo by Ivory House Photography.